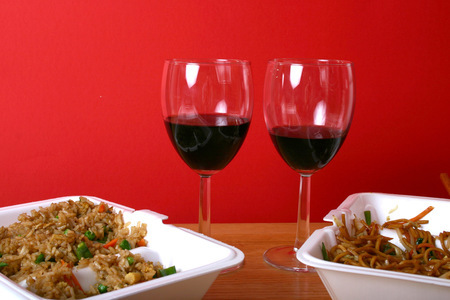 Whether Christmas Eve to you means Santa-tracking and traditional holiday puddings or the latest Woody Allen flick and some quality lo mein, there is no holiday season complete without the perfect wine pairing. If you’re having a Thanksgiving-caliber feast, you might be searching for wines to complement the crispy skin of a roast turkey or chicken, in which case you’d be pleased by brawny, fruit-forward Zinfandel. For those indulging in honey-baked ham, pair it with a crisp and dry (or slightly off-dry) Chenin Blanc. If you’re planning on enjoying some potato latkes with homemade apple sauce, American sparkling wine will promote joy with its fruit-forward, effervescent personality. Hearty and peppery brisket has a deep friendship with Bordeaux – a sultry combo for a winter evening. My friends who traditionally skip the Christmas festivities in favor of cinematic bliss always manage to smuggle a bottle of Gewürztraminer into the theatre with their General Tso’s chicken or Hunan shrimp, as its lychee-and-ginger character has an affinity to spicy Asian foods. As for the dessert course, a house of gingerbread must eventually crumble, and when it does – assumedly at your own hands – pair the spicy treat with succulent, delicate Moscato d’Asti. Minty and ubiquitous candy-canes are great for savoring along with Prosecco, which complements the peppermint rush with a fresh, citrusy, sometimes slightly sweet sparkle. Dense, flaky rugelach, with its cinnamon flair and dried-fruitiness, is perfect with ice wine’s unabashed sweetness and zingy acidity. For more about excellent wine and food pairings and suggestions, check out my latest book, How to Drink Like A Billionaire. Drink richly! 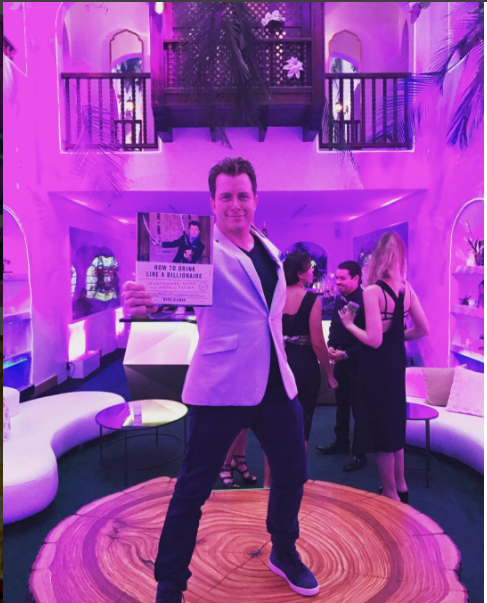 My new book, How to Drink Like a Billionaire, makes for an ideal holiday gift – but don’t just take my word for it. In the last week alone it has been featured in Vanity Fair, Chicago Tribune, Tulsa World, Star Tribune, the Epoch Times, and the New York Times! In case you haven’t heard, I have made it even more tempting to give as a gift. In the next FOUR DAYS, if you buy two (2) or more copies of my book on Amazon, I will send you a FREE copy of my previous book, the award-winning Oldman’s Brave New World of Wine (a $25 value). I will also send you an autographed sticker, personally inscribed by me, which you can include on each book. 1) From now until December 18th, purchase two (2) or more copies of How to Drink Like a Billionaire on Amazon (and I’d be most grateful if you wrote a review!). 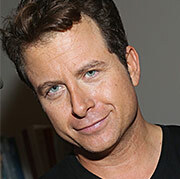 2) Email the Amazon receipt to alf@markoldman.com with your mailing address. 3) We will mail you the signed book labels and a FREE, signed copy of Oldman’s Brave New World of Wine–just in time for the holidays! *: Mark’s signature will be written on separate adhesive labels (i.e., “bookplates”) sent with your free book, and can be applied to each book. Get thee to Amazon! This offer is only available until DECEMBER 18th! 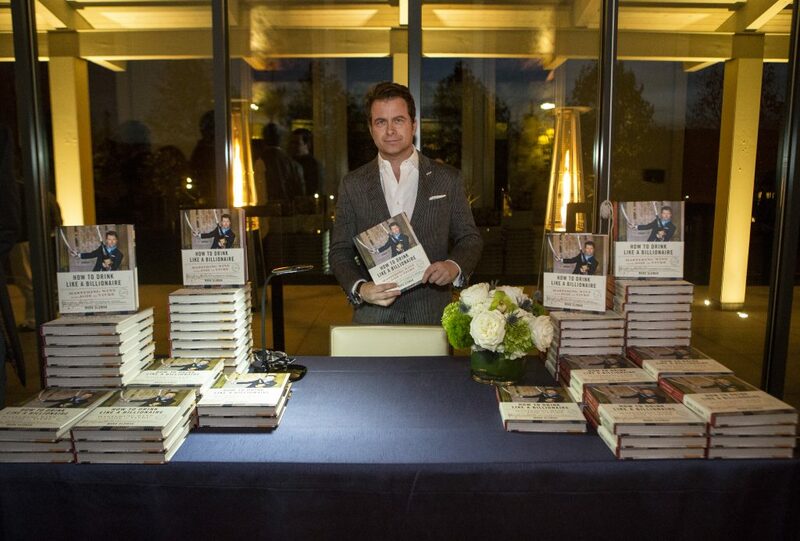 For more on why How to Drink Like a Billionaire is the perfect holiday gift, click here! This holiday season, get signed copies of my latest wine book – How to Drink Like a Billionaire (as recently featured in The New York Times). It’s an ideal personalized gift for the wine lover in your life. Starting today, buy two or more copies of my book on Amazon, and I will send you a FREE copy of my previous book, the award-winning Oldman’s Brave New World of Wine (a $25 value). I will also send you an autographed sticker, personally inscribed by me, which you can include on each book. If you are in Miami, join me at the illustrious Books & Books in Coral Gables, FL this Wednesday, December 7th at 6:30 pm where I’ll be teaching How to Drink Like a Billionaire, and signing books. And for those in the Connecticut/New York area, join me on Thursday, December 8th, at 7:00 pm, at the Barrett Bookstore in Darien, Connecticut. I’ll be in conversation with Nicholas Troilo as we sip and savor some delightful food and wine. 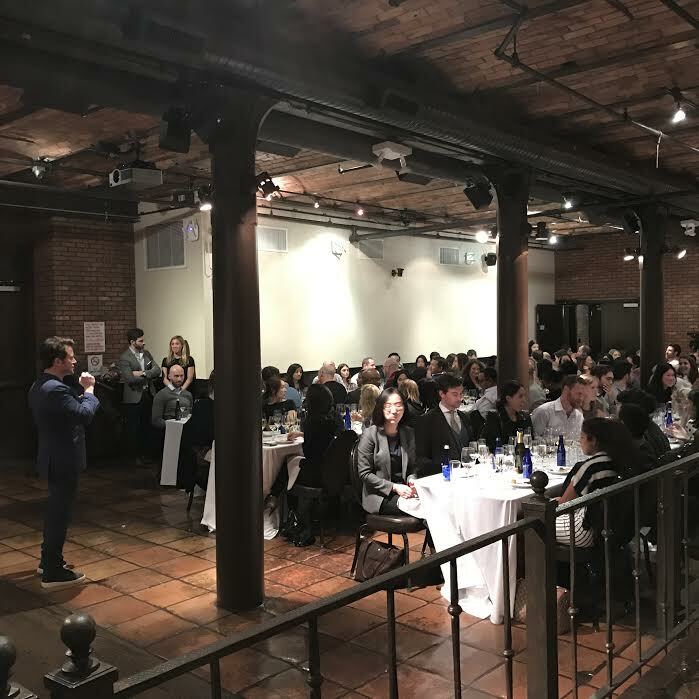 I had great fun teaching a sold-out group of 100+ spirited and smart IVY members at the beautiful Astor Center in New York on November 29th. Finally, a raise of the chalice to sun-soaked South Florida, where my Art Basel Miami events with Perrier Jouët’s cellar master Hervé Deschamps went smashingly. Look forward to clinking glasses with y’all soon at one of my upcoming Billionaire Book Tour events. In the meantime, drink bravely, drink richly, and #DrinkLikeABillionaire. There are few things in this world more satisfying than finding yourself in the wonderful circumstance of discovering wine that is inexpensive, but perceived expensive. This happy valley includes a broad swathe of bubbly, especially the various non-Champagne sparklers in the Crémant category, which manages the trifecta of looking expensive, tasting delicious, and calming the wallet. See my suggestions for the best of this serendipity and just how to spot them. Roederer Estate Brut, Gruet Brut from new Mexico (but owned by French expatriates), and Segura Viudas Aria Brut (with its silvery metal crest) are three key picks in the sparkling category. Other wines that drink and dress above their price include Muscadet, the oyster-worshipping white from France’s Loire Valley, which often carries an old-fashioned, aristocratic-looking label. Beaujolais cru is another winner in both respects, its packaging prominently displaying a Beaujolais cru village – such as the chichi-sounding Morgon and Brouilly – rather than emphasizing the overall region of Beaujolais, which often gets confused with much-maligned Beaujolais-Nouveau. Moderately priced Bordeaux such as Chateau Talbot, Château Greysac, and Château Gloria also offer cachet for less, with elegant labels featuring noble chateaus and coats of arms. Another dependable deal, Rioja from Spain, can have impressively gothic labels and sometimes a wrapping of gold fishnet mesh, which was historically a feature to prevent counterfeiting but now adds a dose of gilded glamour. Another way to lend illustriousness to your bottle is to deliver it in a wooden box, available at finer wine merchants and homeware stores; a gift wine encased this way is like adding a beautiful frame to otherwise humble artwork. Finally, consider personally labeling gift bottles with a tag that suggests food pairings or a cheeky “drink-by” date; a little bit of handwritten effort glows brightly in the digital era. For more about wine and ways to find my best inexpensive suggestions, check out my book, How to Drink Like a Billionaire. Take advantage of the Gift Like A Billionaire Giveaway while supplies last! GIFT LIKE A BILLIONAIRE: Buy 2 wine books, get another* free! The Gift Like A Billionaire Giveaway is here, just in time for the holidays. 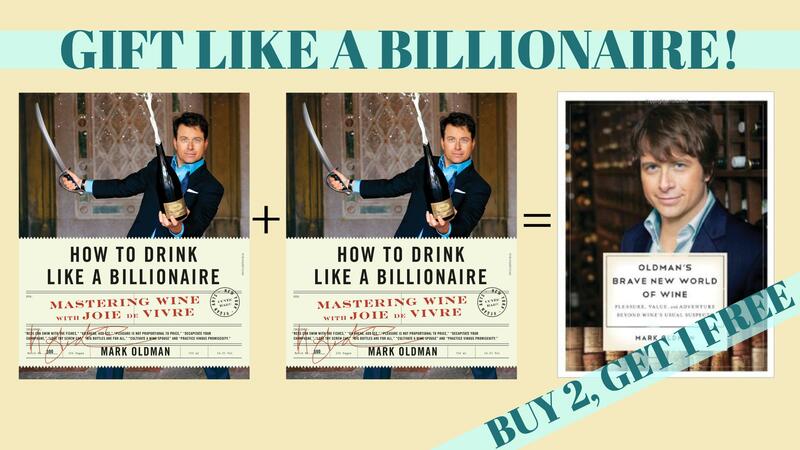 Buy 2 copies of How to Drink Like a Billionaire, and get a FREE, signed copy of my previous award-winning wine book, Oldman’s Brave New World of Wine (a $25 value!). My new wine book, How to Drink Like a Billionaire (Regan Arts), makes for an ideal holiday gift. A stylishly designed hardcover, it will enlighten the thirsty like few other wine books and looks great on your coffee table or book shelf. While supplies last, here’s how to get a FREE copy of my last book, the award-winning Oldman’s Brave New World of Wine. 1) Starting now until December 12th, purchase two (2) or more copies of How to Drink Like a Billionaire on Amazon (and don’t forget to write a review!). 3) We will mail you a FREE, signed copy of Oldman’s Brave New World of Wine–just in time for the holidays! *We reserve the right to refuse to any receipts. *Valid for postage to the continental U.S only.